I'm really taken by those swirly lines in the Swirly Scribbles thinlits set. I knew they'd be going onto my shopping list as soon as I saw them! I made a 5.5" square card from the new Flirty Flamingo cardstock and added layers of Basic Black and the new Affectionately Yours DSP. I then used the 2-way glue pen to glue the black scribbles to the card and finished with my You've Got This panel. The flower in the You've Got This set continues to be one of my favourites. It looks so delicate once it's coloured. I stamped the You've Got This flower with Blushing Bride onto Whisper White cardstock. I then watercolored it using Blushing Bride, Flirty Flamingo and Watermelon Wonder reinkers. If you're interested in how I watercolour - you'll find links to my videos here. 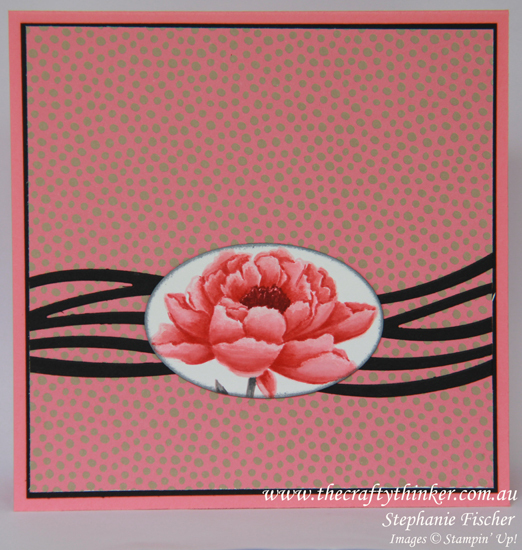 I used a Cherry Cobbler Stampin Write marker for the centre of the flower. I watercoloured the little bit of stem and leaf with Smoky Slate ink and a dab of Basic Gray. I cut the flower with one of the retiring Ovals Collection framelits (these are being replaced with the more comprehensive Layering Ovals framelits) and sponged the edge with Basic Gray ink.